GET YOUR TEST KIT TODAY! Radon Sux is contacted because a home owner had a radon test result come back at higher than 4 pCi per liter. No problem, we are here to help. Radon is a natural occurring gas that is forced into your house through the vacuum put on your basement primarily by the heating and cooling system. By digging a small pit (after appropriate subslab tests are performed) we will be able to decrease, if not eliminate the amount of radon gas in your home by discharging it through your roof before it is drawn into your house. RadonSux is strictly a mitigation company. We will be using your radon test results for our pre mitigation and allowing you to use your pre-mitigation tester to do post mitigation tests or we can supply you with a charcoal hanging kit for post mitigation results. If for some reason your post mitigation test results come back to still be elevated above our national average of 4.0 pCi per liter we will come back to make any changes necessary to the system to guarantee proper results. Some additional fees may be added if a second suction pit is required. Radon Sux will supply and follow all building permits required by all local codes to properly install your radon mitigation system. Attached are copies of RadonSux floor plan sketches of your property to show where the best installation spot. The letter A of your diagram represents where we will be putting the suction pit for your system. B indicates where we will be exiting your roof so that the unit can be properly ventilated into the atmosphere. RadonSux will install a suction point in the appropriate spot and run the exhaust through the roof and seal it to ensure no leaks. RadonSux Only uses premium radon fans for a long lifespan and low utility usage. Radon Sux follows all manufacturers warranties on all electrical and mechanical components installed in your mitigation system. RadonSux gives a full one-year warranty from defects in workmanship on the entire mitigation system. All model and serial numbers of all electrical and mechanical components installed in your mitigation system will be supplied to you in your receipts at the end of mitigation. RadonSux follows all rules and regulations and will report to you if for some reason we are unable to follow all state and RMS guidelines. Radon Sux will be installing a system failure warning device that indicates whether your system is working properly or not. The warning device (Which measures vacuum not radon ) will be located in a very convenient spot so you can regularly check to make sure your system is working properly without wasting any of your time or going out of your way. When the system is working properly and the proper amount of vacuum is shown on your system failure warning device, we can then guarantee that your electrical and mechanical system of your mitigation system is working properly to manufacture specs. If at any time you see a large change in the red water levels being even with each other in your failure warning device (Commonly called a Utube )or if it levels out completely please check your radon mitigation supply power switch or electrical circuit breaker to verify power. If No breakers are tripped please contact RadonSux on their 24 hour hotline 712-281-7707 and we will be able to properly inform you of the steps to take to get your radon mitigation system up and running ASAP. All fees included in your installation manual include permits, State of Iowa radon program fee of $40, and the use of a licensed electrician for all your electrical needs. Radon Sux has no hidden fees, just quality workmanship at a fair price. Please feel free to contact RadonSux At 712- 252-0312 Our Iowa radon licensing number is #M00146Y. Our state radon office phone number is 1-515-281-4928 Attn: Rick Wilke if you have any questions or concerns about how RadonSux did installing your radon mitigation system. Rick also likes to hear positive responses about his truly valuable, well-informed, properly trained Radon mitigation professionals and how they did for you today. 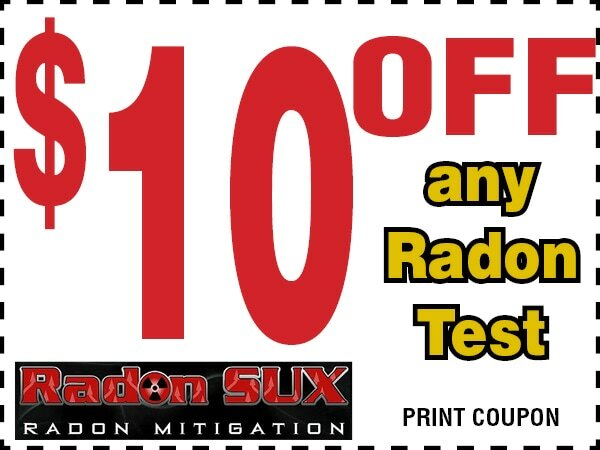 Thank you for choosing RadonSux as your state certified radon mitigation services. If you have any further questions feel free to contact Tony at 712-281 -7707 or by email at radonsux@gmail.com.